Director: Woody Allen. Cast: Gena Rowlands, Ian Holm, Mia Farrow, Gene Hackman, Blythe Danner, Sandy Dennis, Martha Plimpton, Harris Yulin, David Ogden Stiers, John Houseman, Betty Buckley, Philip Bosco. Screenplay: Woody Allen. I'm sure by now Woody Allen accepts that his comic reputation will forever prevent his dramatic films from generating the attention they merit. For that matter, even Woody's comedies do so little business anymore that he can't be too choosy about which projects garner public notice, so long as some of them do. You don't realize how much we lose by hanging the sober sides of Woody out to dry until you see a film like Another Woman. Commercially ignored and critically unheralded even by Allen's up-and-down standards, this stands nonetheless as a sensitive, accomplished, and ambitious picture that should have bolstered Allen's claim on wider audiences instead of dooming him into a niche of making only "Woody Allen movies." Yes, as in many of his more serious-minded pictures, Allen reveals such an infatuation with All Things Bergman that his own voice comes close to vanishing. Another Woman is, like Deconstructing Harry after it, essentially Allen's attempt to recast Wild Strawberries around his own set of neuroses, though in this case at least he does not make the redundant error of casting himself in the lead role. Given his notorious bent toward self-laceration, both in his humor and his melancholy, Another Woman occasionally appraises its protagonist more harshly than it needs to. In fact, one might cringe at how harshly the picture treats its heroine if a) anyone had seen this movie, or b) if Marion Post, the philosophy professor played by Gena Rowlands, were not so clearly written as a stand-in for Allen himself, and c) if Rowlands weren't so exceptional in the part that we'd rather see the character handled roughly, by her intimates and her creator, than lose the chance of meeting her to begin with. Marion, like most of Allen's subjects, has all the accoutrements of a perfect, carefree life. She has a solid professional reputation, a stable marriage, and enough money that, when she craves more private space for her writing, she can rent an apartment downtown for the sole purpose of providing a creative, unobstructed environment. As with most perfect surfaces, however, Marion's life has plenty of compromises and blemishes. Worse, she not only fails to acknowledge most of these, she often seems to have genuinely forgotten them, or to have never recognized them in the first place. Her life is a deceptively sturdy-seeming thing built over a vast webbing of fissures and faultlines of which she remains blithely unaware. Marion does not begin to examine the ways in which she has pained or neglected other people until an unforeseen event that is an obvious dramatic conceit but one that the movie and the actors sell with casual conviction. Because of idiosyncratic New York ventilation systems, Marion discovers in her newly-rented atelier that she can hear distinctly the confidential confessions from the office of the psychiatrist next door. Hence, with unsubtle but effective symbolism, Allen begins Marion's journey of self-scrutiny at the very moment when she believes she has officially, happily installed herself in a solitary, impenetrable space. The most striking voice that Marion hears is that of Mia Farrow, cast here as a woman named Hope (!) who describes to her psychiatrist the almost ineffable "anguish" she feels every day. Marion's first reaction is to be grateful that she herself feels nothing like this woman's sorrow. Before, however, much time passesliterally, since the film is only 81 minutes longshe recognizes her complacency and starts to sense the sadness in her own life. Her marriage, to the always-welcome Ian Holm, has grown passionless and frighteningly uncommunicative. She is bored with her friends, most of whom are in turn quite frustrated with her. A chance encounter with the closest friend of her youth, indelibly played by an atypically acidic Sandy Dennis, disintegrates into a protracted revelation of old resentments: news to Marion, but unforgettable and unforgivable to her erstwhile pal. Doesn't anyone like Marion Post? Her stepdaughter, played by Martha Plimpton, idolizes her, but in the starstruck manner of the youthful pupil who ignores her teacher-hero's less flattering traits. Allen generously scripts a nice moment when, while dining out with friends, Marion receives an unexpected tribute of thanks and admiration from a former student. Still, none of the people who have real access into Marion's life or specific roles to play in it are nearly as fond of her or impressed by her as are these comparative strangers. The feigned pleasantness of her friends and family is explicitly theatricalized in a dream sequence where they are all actors in a long performance, their niceties dutifully recited, their criticisms spoken with real conviction. The scene has particular sting because Marion also comes to see herself as a sort of actress, putting forth false fronts to her friends and hiding herself in academic abstractions. For the first time, she realizes how many people in her circle harbor the same muted but nagging contempt for her that she feels for them. Though Marion's revelations are nasty, the film neither bores nor abrades, largely due to the focused work by everyone before and behind the camera. Rowlands, who made her biggest impression playing heartbreaking nutcases in her husband's films (A Woman Under the Influence, Love Streams, Opening Night), ably communicates a different kind of mental illness in this movie: the bewilderment of a woman who relies too much on her mind and her reason. Though Cassavetes often pushed her to wild flourishes of inspired grandiosity, Rowlands can work as tautly and economically as anyone in Hollywood. She is strikingly well-cast as Marion, especially for viewers inclined to associate her with wilder feelings and huger gestures; in a part and a performance that utterly lacks these kinds of excess, Marion only seems more intensely bottled up. By past association, then, as well as by surgical strikes of line-reading, bodily movement, and eyeline focus, Rowlands suggests a deeply controlled personality without indulging the kinds of neurotic mannerisms that might editorialize too broadly to the audience, and could pit the actress against a character rather than helping to illuminate her. Mia Farrow, riding a careful line as the lachrymose patient whom Marion overhears, and Gene Hackman, as an ex-lover who includes a Marion-like figure in one of his novels, are the other top-billed stars of Another Woman, and both impress. Truth be told, though, neither has as much to do as we might wish. 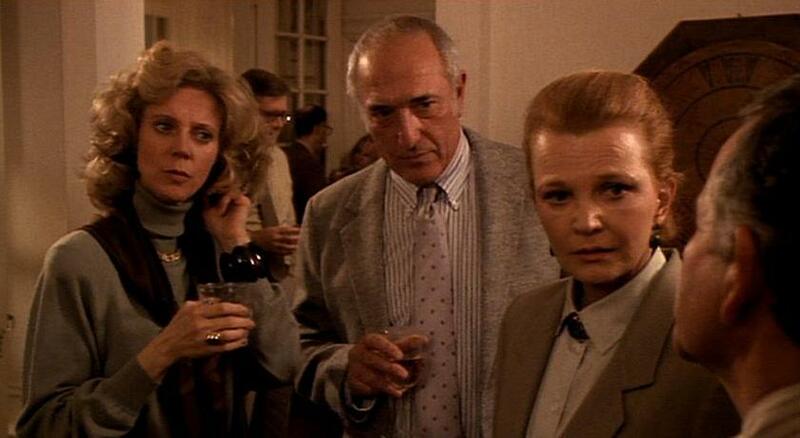 Like Dennis, Holm, and the other conspicuously talented members of the cast, they effectively convey their characters' emotions without intruding much upon Rowlands' position at the center of every scene. By focusing with such discipline on Marion, frequently incorporating her voice-over narration, the film intentionally and articulately approximates the solipsistic tendencies of the woman herself: again rendered through formal choices and rigorous managing of perspective, so the actress doesn't get stuck transmitting her narcissism through ungainly semaphores. So who, in the end, is the "other woman" pointed to in the film's title? Farrow, as the catalyst for Rowlands' own internal odyssey, seems like an obvious candidate, and another character assumes the status of adulterous rival that the label "another woman" colloquially connotes. These interpretations are worthy, but as the story of a woman who makes such shocking realizations about her self and her behavior, the "other woman" in Marion's life seems to be Marion herself, who has started to realize how different she has become from the person she used to be, or the person she thought she still was... both of whom she may still imagine in unwittingly skewed ways that are convenient to her, and whom outside eyes might judge as a reassuring falsehood. Something else Another Woman captures, then, is the bitter truth that even our least forgiving portraits of ourselves can read as strategic or soft-balled to people who know us and have reason to critique us. It's even sadder and more provoking of anger when one's attempts at introspection or atonement are dismissed as feeble or insincere. Rowlands and Allen conspire expertly to show us Marion's capacities for apology and embarrassment, but also her indignation when even these, somehow, are deemed not enough. Another Woman captures all of this while demurring from any big shouting scenes or gusty monologues If anything, its most blistering emotional moment is a terse, tense, but grossly even-toned standoff between Holm's character and his first wife (a pitch-perfect Betty Buckley), an interlude where Marion seems to embody the title phrase in yet a new way. Another Woman is the product of that "other" Woody Allen, the one whose dramas are often piercing and unhappy in ways that can upset fans of his buoyant comedies. Of course, as landmark Allen achievements like Hannah and Her Sisters, Annie Hall, Manhattan, and The Purple Rose of Cairo amply demonstrate, even his ostensible comedies often entail prickly dramatics and disconsoling darkness. By that same token, one should not mistake the more overt seriousness of films like Another Woman as a pretentious suppression of a somehow more "natural" clownishness. Bergman's influence, not only on story and character but even within Allen's crewthe Swede's longtime cinematographer Sven Nykvist shows up here as Allen's collaborator, as he did in the following year's Crimes and Misdemeanorsaffects the film much as Farrow's character influences Rowlands' within the film. His emotionally severe, aesthetically astute, and narratively compressed example provides the inspiration and groundwork for Allen's investigations, prompting him toward places he might not otherwise have gone. Nonetheless, like Marion's, Allen's journey here is distinctly and unmistakably his own. The air feels cold in the whole film, even in interior spaces, and the palette looks like autumn leaves, but if these environmental qualities are hardly subtle, they don't feel relentless. Mostly this film with few smiles suggests Marion's sincere if unpracticed grapple with effects she didn't realize she had on people, and with unrecognized implications of her own most conscious choices.